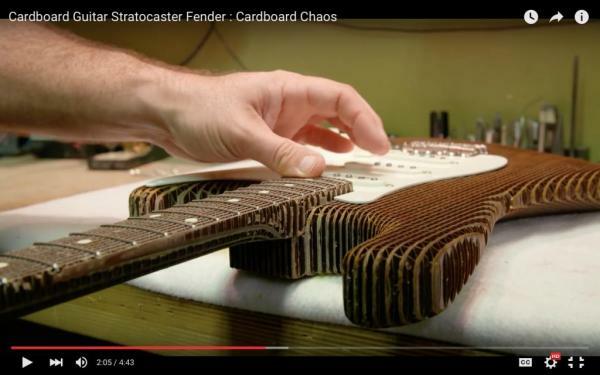 A California snowboarding company created a working Fender Stratocaster guitar out of cardboard as part of an internet series where the group recreates various items using paper. Signal Snowboards, based out of Huntington Beach, Calif., partnered with Los Angeles’s Ernest Packaging and Fender Custom Shop to create a working Fender Stratocaster made of cardboard for a YouTube series entitled Cardboard Chaos. The video shows the process of designing and constructing the one-of-a-kind guitar and shows it being put through it’s paces by several Fender employees and Linkin Park lead guitarist Brad Delson. “I play these guitars on stage and the similarity, in terms of even just the look of it, to what I’m used to is amazing,” he said of the cardboard guitar. The body of the guitar was made entirely of cardboard and then fitted with the same pieces used on actual Fender guitars, in order to give it the most authentic sound possible. Fender Master Builder Dennis Galuszka declared that it sounded like a Stratocaster after getting the chance to play the guitar. “The fact that it plays at all is kind of remarkable, honestly. It’s cardboard,” he said.